Lizards are a type of reptile that evolved from ancestors walking the Earth more than 200 million years ago. Lizards live in a variety of habitats, from desert plains to river banks. The wide array of landscapes found in California, in addition to the state's warm climate, makes a suitable home for numerous families of lizards. The types of lizards found in California are both native and introduced. Species belonging to the family Anguidae include the Elgaria coerulea (northern alligator lizard), Elgaria multicarinata (southern alligator lizard) and Elgaria panamintina (Panamint alligator lizard). These smooth-scaled lizards are found almost everywhere except in the desert. Belonging to the family Anniellidae is Anniella pulchra (legless lizard), which resemble snakes in appearance and is generally uncommon. 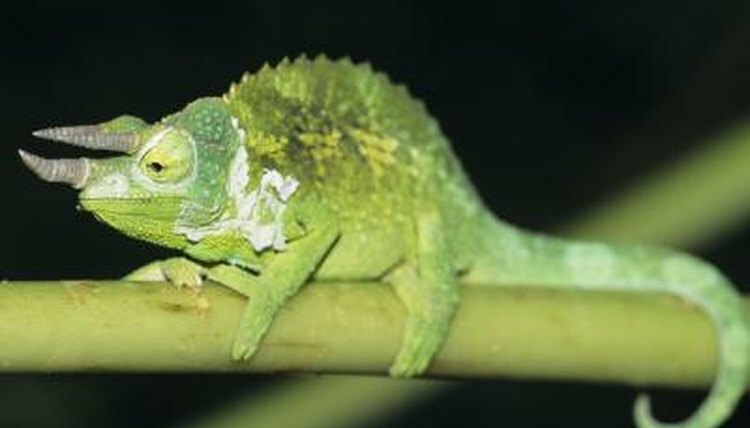 Family Chamaeleonidae includes Chamaeleo jacksonii (Jackson's chameleon), a species introduced to the southern coast. Family Crotaphytidae includes collared lizards and leopard lizards -- large lizards found in rocky and open desert environments. Family Gekkonidae consists of Coleonyx switaki (Switak's banded gecko), Coleonyx variegatus (western banded gecko), Phyllodactylus nocticolus (leaf-toed gecko) and Hemidactylus turcicus (Mediterranean gecko). Geckos are active at night and rest under debris during the daytime. Family Helodermatidae consists of Heloderma suspectum (Gila monster). The Gila monster is a rare and venomous lizard found near the Nevada border. Family Iguanidae includes Dipsosaurus dorsalis (desert iguana) and Sauromalus ater (chuckwalla), which are active during the daytime in sandy and rocky desert areas. Family Lacertidae includes Podarcis siculus (southern Italian wall lizard), which is a species introduced to the southwest coast. Family Phrynosomatidae is a large family of diurnal lizards. Genera include Callisaurus (zebra-tailed lizard), Petrosaurus (banded rock lizard), Phrynosoma (coast horned lizard, pygmy short-horned lizard, flat-tail horned lizard and desert horned lizard), Sceloporus (common sagebrush lizard, desert spiny lizard, western fence lizard, granite spiny lizard and yellow-backed spiny lizard), Uma (fringe-toed lizards), Urosaurus (long-tailed brush lizard, Baja California brush lizard and ornate tree lizards) and Uta (common side-blotched lizard). These lizards are commonly found in California's ample desert and grassland environments. Family Scincidae includes Eumeces gilberti (Gilbert's skink) and Eumeces skiltonianus (western skink). Skinks prefer moist habitats and take cover under leaves and debris during the daytime. Family Teiidae includes Aspidoscelis hyperythra (orange-throated whiptail) and Aspidoscelis tigris (tiger whiptail). Whiptails are active reptiles that prefer dry, hot desert plains. Family Xantusiidae includes the genus Xantusia, or night lizards (varieties include sandstone, granite, island, desert and Baja California). Night lizards are active both day and night. They live in mountain and desert environments and hide under debris during the day when temperatures are at their peak.